At Southwest Wildlife Conservation Center our focus is helping animals. But animals are not the only ones that need help. We recently had Hope Kids visit our sanctuary. Hope Kids provides ongoing events, activities and a powerful, unique support community for families who have a child with cancer or other life-threatening medical conditions. Their visit, although brief, helps to keep the children and their families focused on the future rather than dwelling on their illnesses. After a tour of our Sanctuary, the families met at the Ramada for a snack, and a special guest appearance from “Harvey,” the burro. Needless to say, he was a HUGE HIT! Once Harvey had his fill of carrots, the children were given gifts to remember their visit: a toy from the Hope Kids organization and a stuffed animal from Southwest Wildlife. Caring knows many levels. 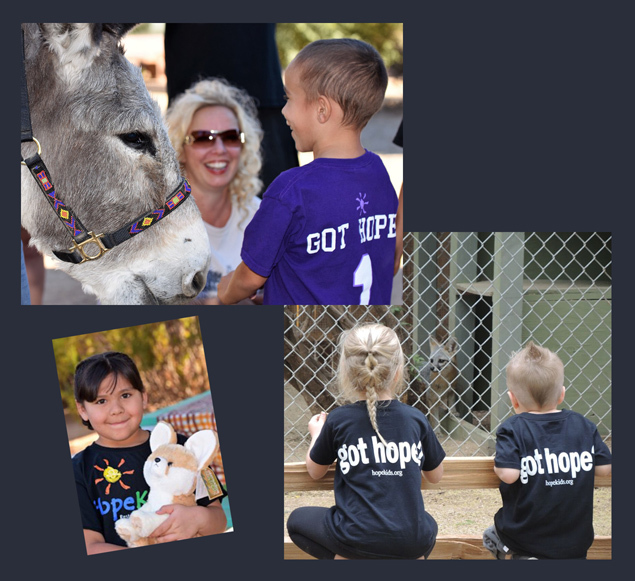 Southwest Wildlife is pleased to share some of the struggles our animals have been through, while recognizing the battles that many of the Hope Kids experience every day.